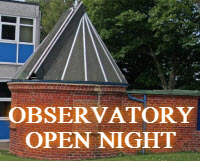 Observe the night sky with us at the Bruce Observatory, Whitby School. Observing Nights are held weather permitting: check for a relatively clear sky before leaving home. If in doubt, Mark can be reached on tel 01947 605516.